What would you do if you caught your best friend cheating at the Olympics? 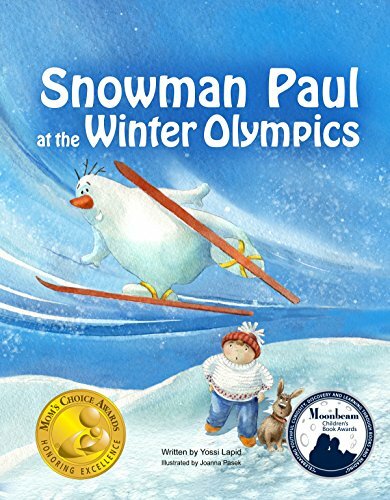 The Winter Olympic games are just around the corner, and Snowman Paul will be there, looking for gold. How far will he go in pursuit of his Olympic dream? This Olympic themed book teaches children the valuable lessons of fair competition and telling the truth. To win a silver or a gold. Besides, it's risky, you might fall. So, let's forget about it, Paul!" Meet Paul, a snowman with big dreams who is not afraid to be different or tell the truth. Fast paced and stunningly illustrated with 42 full-page watercolors, this rhyming story will be enjoyed by children and parents alike. It is perfect for cold winter days and warm summer times. It is a great bedtime story, and it is ideal for beginner readers. It makes a beautiful gift, and it will show you how much fun winter can be if you embrace your imagination. Are you ready to experience the Olympic thrill?